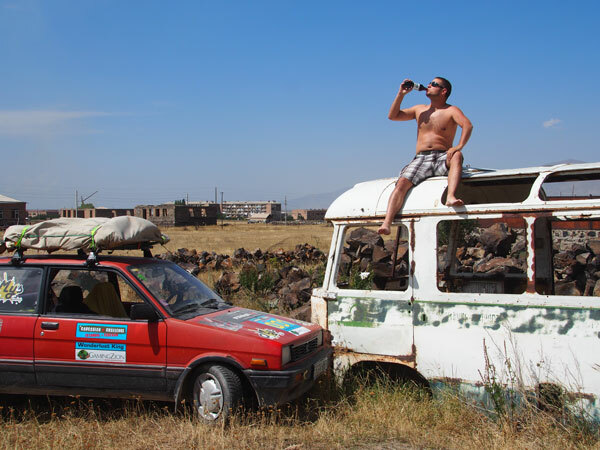 Meet Hungarian Team Wonderlust King, who’ve just completed the Caucasian Challenge 2016 in their rusty, old but still trustworthy Subaru Justy. It didn’t only carry them all across the Caucasus, but it also served as a hotel room for the team on several occasions. Let’s see what the winners of the sought-after Bonkers Award have to tell us! Hi there, Team Wonderlust King. You are András and Ádám, aren’t you? Ok, ready to roll? What drove you to come and take part in this rally, and what expectations did you bring to it? András: Our expectations? Well I first saw Caucasian Challenge, the very first one, on TV, on RTL klub it was I think. I loved the idea, so told Adam all about it at school the next day, and that we had to go and do it. Receiving their well deserved Bonkers Award. You were still at school then? András: Yeah, high school. But I kept saying that we should get a dodgy banger or something and just go. I’m a born adventurer at heart, and love driving too. As for our expectations…we expected ourselves to complete the challenge, that’s all. 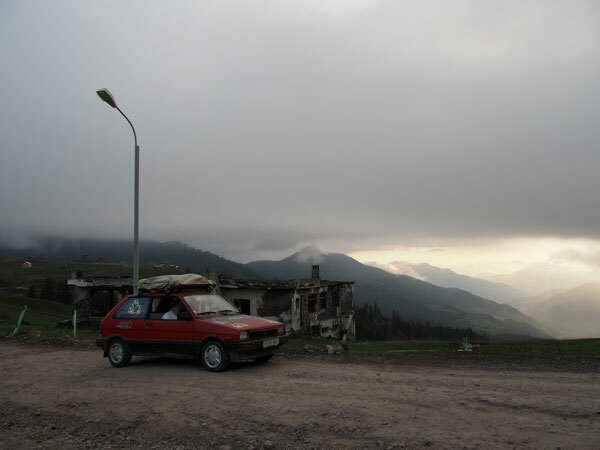 We tried to get a car as cheaply as possible, any old rustbucket would do basically. In the end we found one for 120.000 Fts ($450), and well, prayed that it would make it to the end. And how did reality compare to your expectations? Ádám: I hadn’t expected it to be quite this amazing to be honest, it was a great surprise that it turned out to be this fab. I thought it would be sleeping in tents and roughing it all the way. But no, it was, well organised and totally awesome. What was the scariest part? Did you encounter any bears? Ádám: No, no bears, but the time it started to dawn on us that 4WD in itself was not going to cut it, but we need proper height too. I did fret a bit that the terrain was going to be like that all the way, but thankfully it wasn’t. András: I think Ádám had another one, a close shave when he was in the middle of overtaking a pickup truck, and they were going side by side at the same speed for a quite a while when a bus suddenly turned up heading in the opposite direction, hurtling straight for us. Ádám: This was still in Georgia. Brave little Justy made it all up the mountains! What were the highlights of the rally for you? András: For me, it was the view, the wide open spaces, where you could see the horizon all around, and the villages we passed through. That, and the mountains in Georgia, and Karabakh, they were basically just begging to be photographed. And the locals everywhere. This was also a surprise because I’d read that Georgians aren’t the most sociable of people. When we broke down and went to the wrong garage, the local lads came and took us to the right one, and explained to the mechanics what the problem was. They stayed with us for five hours, and wouldn’t accept a cent at the end. Ok, next up: Describe Caucasian Challenge with a single word. 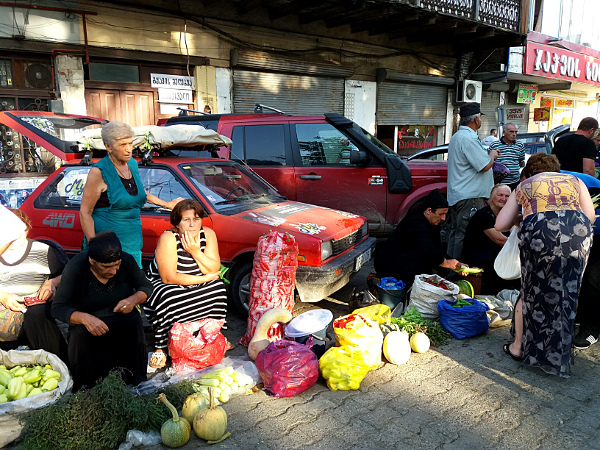 Ádám: Ah yes, we woke up to these people leaning against the car, selling their parsley and dill and marrows all around us. András: I was jolted awake by the dull thump of a sack of peppers hitting the car. For a minute, I actually thought I’d dreamt it all. Careful where you park in the evenings. What advice would you give to those who’ll take the Caucasian challenge next year? 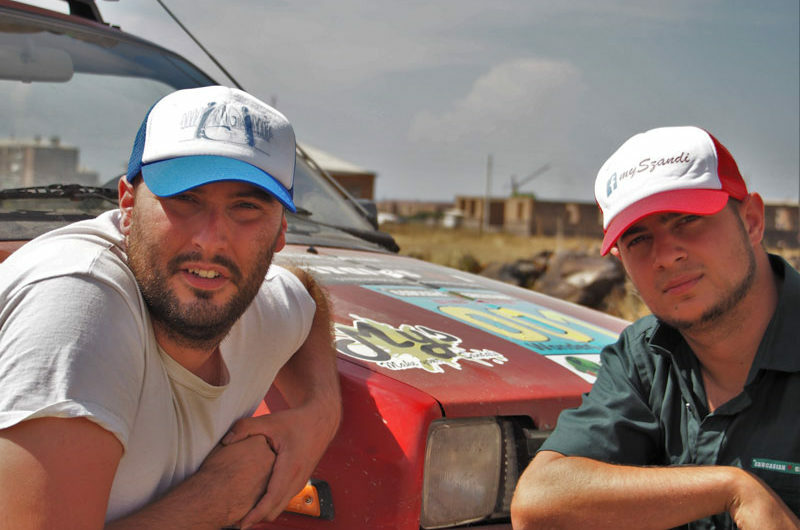 Ádám: Don’t scrimp on the car. It could backfire badly. András: And get car with big subspace. In some situations it could make all the difference. Next postWhat We Learned on The Latest Baltic Run!